Spain’s Socialist prime minister defended Wednesday arms deliveries to Saudi Arabia despite an outcry over the murder of a Saudi journalist Jamal Khashoggi, saying it was in the country’s ‘interests’ to keep selling military hardware to the kingdom. ‘If you ask me where I stand today, it is in the defence of the interests of Spain, of jobs in strategic sectors in areas badly affected by the drama that is unemployment,’ Prime Minister Pedro Sánchez told parliament. Spain’s state-owned shipbuilder Navantia in July signed a deal worth 1.8 billion euros to supply oil-rich Saudi Arabia with five navy ships. The shipbuilder is located in the southern region of Andalusia, a socialist bastion which has one of Spain’s highest unemployment rates and which will hold regional elections in December. 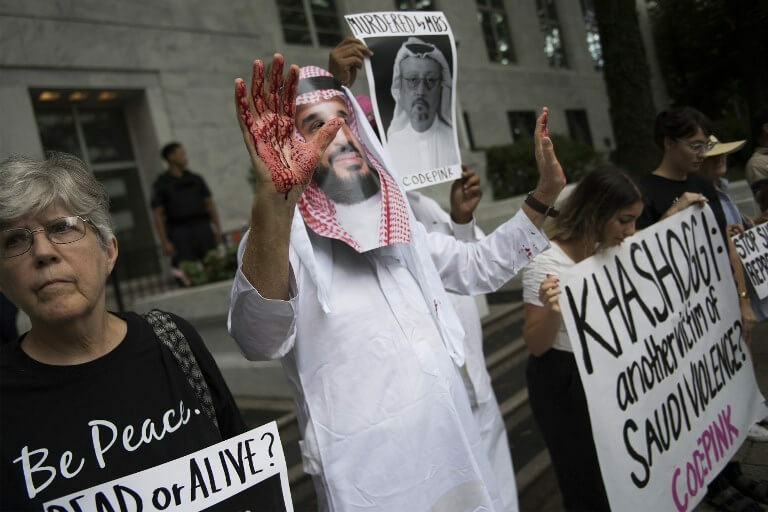 Sanchez said he shared the ‘dismay and condemnation’ of international public opinion regarding the ‘horrible assassination’ of Saudi journalist Jamal Khashoggi at the kingdom’s consulate in Istanbul. But the ‘seriousness of these horrible events which I unequivocally condemn can not and should not prevent us from acting responsibly,’ he added. Catalan separatist parties and far-left party Podemos, whose support Sánchez’s minority government depends on, have called on the government to suspend Spain’s arms sales to Saudi Arabi in protest against Khashoggi’s murder. Sanchez’s government came under fire in September after it decided to go ahead with the delivery of 400 laser-guided bombs to Saudi Arabia, amid concerns that they could harm civilians in Yemen where the kingdom is engaged in a bloody conflict. The government had earlier said it would block the export of the weapons but Sánchez justified the about face at the time on the grounds that it was needed to preserve good ties with the Gulf state, a key commercial partner for Spain. Khashoggi, a Washington Post columnist and prominent critic of powerful Crown Prince Mohammed bin Salman, was killed after entering the consulate in Turkey on 2 October. His murder has revived the debate in countries around the world over their ties to Saudi Arabia. German Chancellor Angela Merkel said Sunday that Berlin would not export arms to Saudi Arabia for now in the wake of Khashoggi’s violent death. Canadian Prime Minister Justin Trudeau said Tuesday that it would be ‘extremely difficult’ to cancel a 2014 blockbuster sale of armoured personnel carriers to Saudi Arabia Without ‘paying exorbitant penalties’.